1955 Le Maine Libre Le Mans Poster - Fangio - Mercedes 300 SLR. 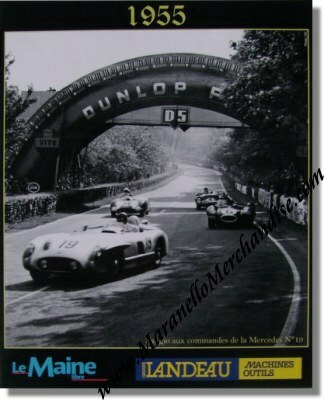 Issued by Le Maine Libre, a local Le Mans newspaper, in 2006 it shows the Fangio at the wheel of the # 19 Mercedes-Benz 3002 SLR (S/N 0007/55) while being chased by the # 6 Jaguar D-Type of Hawthorn / Bueb (Mike Hawthorn at the wheel; they would win this race) and the # 4 Ferrari 121 LM of Castellotti & Marzotto who are in the process of overtaking the # 34 Bristol 450C of Wilson & Mayers. 1955 was of course the year of the biggest catastrophy ever at Le Mans and following the accident of Pierre Levegh, all Mercedes cars were withdrawn from the race.